The best diving in the world! Everyone says they have it. Others say it is at Kokays Maldito Dive Resort on Malapascua Island, Cebu. All the Fun, Under the Sea! Head over to our Accommodations page for details. Also, check out our new photos of the resort and island impressions here. Restaurant, Bar, Disco, Music Lounge, Billiards and Internet Cafe. White beach, Tropical Drinks, Great Food and a lot of party fun. All under one big roof. Get on it! A great selection of local and international food, from early breakfast over a light lunch or a romantic dinner at the seaside, up to late night snacks. There is something for everybody. A vast selection of Cocktails, Beers, Shakes, Liquors, and Soft Drinks are available to quench your thirst. Whether you just want to enjoy the music with a wonderful cocktail or dance all night long, Kokay's Maldito party is like nowhere else. 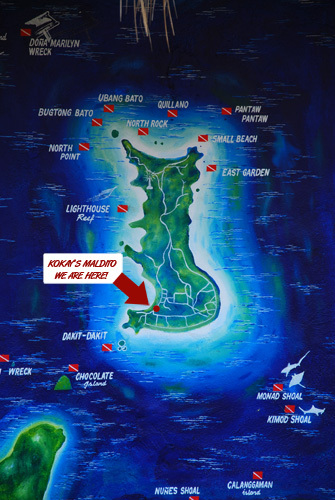 Our friendly and accommodating staff will make your time in Kokay's Maldito unforgettable and worthwhile. So don't wait, visit us now! Kill time and chill in our cozy lounge. A pool table is also available if you fancy a game of billiards. Internet connected computers stations are also available if you want to go online. 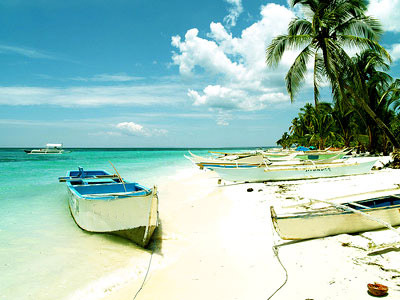 The small island Malapascua is located about seven kilometers north-east of Cebu and about 25 kilometers west of Leyte, home to a traditional fishing community of around 3500 people. Malapascua Island is also known as Logon Island, named after Barangay Logon, the main village in the southern part of the island. Malapascua is a small island which is about 2.5 kilometers long and 1 kilometer wide. Surrounded by her natural white sugary sandy beaches with a crystal clear water. The island takes 3 to 4 hrs to walk around. Locals are friendly, and always with big smile in the face like no stress at all. They are interested to meet foreigners and like to find out your name and were you come from. The island is also suitable for families and young children. Not just the shape of this small island reminds of the island of Boracay, also everything else can easily keep up. In fact, on Malapascua Island, everything is somewhat smaller, but the mix is right. That is why Filipinos have begun to call Malapascua Island the "little Boracay". Malapascua is one of the best place in the world where you can relax and enjoy diving. For divers, Malapascua is arguably the only place in the world we know of, where you can see thresher sharks, only 22-26 meters deep, at the Monad Shoal. Take a taxi from your hotel or Mactan airport to North bus terminal and board one of the buses to Maya. The rides takes approximately 3 to 4 hours directly to Maya port. Or take a taxi direct to Maya port which is more faster and comfortable way to travel. At Maya port, take the outrigger boat going to Malapascua Island for 30 to 40 minutes. Land area: 115,830 square miles or 300,000 square kilometers. The total land area of the Philippines is comparable in size to Italy. Highest peak: Mt. Apo in the island of Mindanao is 2,954 meters or 9,691 feet above sea level. Climate: Tropical with 2 distinct seasons: wet and dry. Currency: Peso (PHP) Philippine Peso Currency Converter for the latest exchange rates. The National Capital Region comprises the cities and municipalities of: the City of Manila, Caloocan City, Las Piñas, Makati, Malabon, Mandaluyong, Marikina, Muntinlupa, Navotas, Parañaque City, Pasay City, Patros, Pasig, San Juan, Taguig, Quezon City and Valenzuela. Form of Government: Republic with three (3) equal branches of government namely: the Executive, the Legislative and the Judiciary. Chief Executive & Head of Government: The President. The Executive branch include the Cabinet comprising of Secretaries of each Department. Legislative: Congress of the Philippines comprising of the Senate (upper house) presided by the President of the Senate and the House of Representatives (lower house) presided by the Speaker of the House of representatives. There are more than 10 million Filipinos who live overseas, of this, about 8 million are OFWs or Overseas Filipino Workers. According to the Central Bank of the Philippines, overseas Filipinos remitted an estimated $14 billion to the Philippines in 2006. Yearly, this figure goes up. Dr. Jose Rizal, the national hero of the Philippines can read and write at the age of 2. He grew up speaking 20 foreign languages including French, Greek, Chinese, Latin and German. The Philippine flag is the only flag in the world that is displayed upside-down when the country is in war (red on top and blue at the bottom when in war). The Philippines is considered the "text capital of the world". Of the estimated 35 million cell phone subscribers in the Philippines in 2006, about 350 to 400 million SMS (Short Message Service) or text messages are sent daily. This figure is more than the total daily text messages sent in the U.S. and Europe combined. Although the land area of the Philippines is roughly 1/30th of the United States, The Philippines has a total coastline of 36,289 kilometers while the total U.S. coastline is a modest 19,924 kilometers.